As we know, the frequency Hertz in our mains power supply is 50 Hz or 60 Hz. Most countries of Asia and Europe are using 50 Hz power supplies, United States, Japan (50 Hz and 60 Hz), Canada, Brazil, the Philippines, Saudi Arabia and other countries are using 60 Hz power supplies. Why aircraft is using 400 Hz power? The reason is, the higher hertz of the power supply system, the lesser of copper and steel materials of the generator and transformer being used, which lead to light weight and low cost. The disadvantages are the electrical equipment and wiring inductance increase, capacitances decrease, losses increase, reducing the power transmission efficiency. Conversely, lower hertz will increase the use of materials, which lead to higher weight and costs. So, 50 Hz, 60 Hz is an appropriate value for mains power supply, 400 Hz for aircraft, military, vessels, navy ships etc. The aviation industry has a saying: "Fighting to reduce every gram!" Therefore, in order to reduce the size and weight, high-frequency generators are required on aircrafts. And the power transmission line is not long on the plane, the loss is not a major consideration. Hence 400 Hz is the choice. In fact, there are even higher frequencies on military power supplies. 400 Hz ac power supply has strong adaptability, high stability and stable output waveform. As 400Hz is high frequency power supply, hence the volume is relatively small, which is used a lot in aircraft, vessel, military electronic equipment. The special working environments have strict requirements of 400 Hz power supplies, in order to ensure the stability of 400 Hz power supply, it's necessary to check and debug the AC power source. Technicians have better understands of the operating characteristics of the 400 Hz power supply through commissioning and debugging of its the technical parameters and working conditions, to make the best use of its effect. 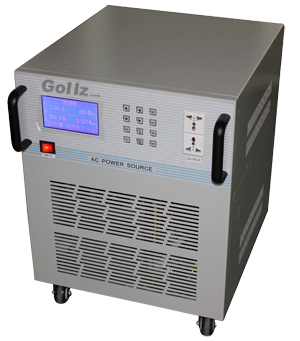 According to GoHz introduction, the commissioning of 400 Hz power supply includes output load regulation, environmental temperature testing, acceleration shock testing, vibration testing, electromagnetic compatibility testing, aging testing, etc., relate to every aspect of its usage. In order to ensure the stability of 400 Hz AC power supply and eliminate the potential risks, a regular maintenance is required, especially for aircraft, navy ships and military electronic equipment. How to get 115V AC 400Hz power supply for aircrafts, vessels? The country city power grid is 110V 60 Hz, 220V 50 Hz, 240V 50 Hz, 400V 50 Hz, 480V 60 Hz etc, the frequency (Hz) is 50 Hz or 60 Hz AC power, but as the specialization in particular industries like aviation and some education purpose, it requires specified Hertz and Volts, e.g. 115VAC 400 Hz. For these projects, the best way is buying a GoHz frequency converter, which allows you converting 50/60 Hz to 400 Hz and also can step down/step up Volts to 115V AC.